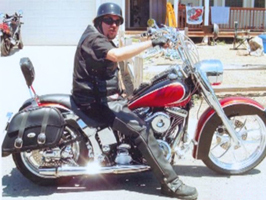 "When Mountains Crumble to the Sea"
On February 3rd, 2007 we lost Larry Ratto to a tragic motorcycle accident. We were left devastated. It was so unreal to wake up and have a brother like Larry gone forever. Our hearts were broken. I am very proud of the fact that we all pulled together to help each other and try to get through this tragedy. We all became closer as a family after Larry's passing. With this comfort, we began the process of healing. 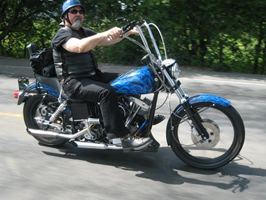 On May 27th, 2007, less than four months later, we lost Dave Komro to yet another tragic motorcycle accident. The unreal quickly became surreal. I can't put into a million words how it feels to wake up and have two Brothers like Dave and Larry gone forever. Dave was our rock and the glue that held us all together. Life as we all know can be horribly unfair, and at times any single loss of life can be hard to bear, but two shinning souls gone so close? This family is hurt and we are still broken. The shock of losing so much weighs heavy in all of our hearts. How do we move on? "Orphan's bless us, and the widow's heart is glad"
We know that time heals all, and faith fills bleeding hearts. As long as Larry and Dave's broken motorcycles serve and remind us of their individual tragedies, we will all remain broken just like them. It has become our charge to honor our fallen Brothers by restoring both bikes to their rightful glory and returning them to the families with all our love and support. Then and only then can we move on and heal. "A community with heavy heart can rebuild anything"
So I ask of you to join us and help honor our fallen Brothers in a most unique Sonoma County event. We decided to set up a Day ride/overnight camping memorial run to raise the money to help restore both bikes. Any and all donations beyond that will be donated to the ECV Fund and the Larry Ratto Music Scholarship. It is our goal to honor and pay tribute to Dave and Larry every year, and our promise that as the Stewards of their good names, to use all donations to benefit both charities exclusively in the future.